While people in Congress are concerned about the impact of the sequester on people who fly in airplanes and who visit the White House, they have no concern for Indian young people who have never flown in an airplane and who will never visit the White House because they are trapped in the cycle of poverty. Civil rights attorneys from the U.S. Justice Department contend a federal judge wrongly denied a request to establish satellite election offices for American Indians on three Montana reservations. William Howard Taft served as President of the United States from 1909 to 1913. Like most American Presidents, Taft took office with little background in or awareness of American Indians. Yet during his term as a progressive Republican he impacted the lives Indian people. American Indians occupied, utilized, and developed the peninsula known as Florida for thousands of years. Our knowledge of the ancient past-of Florida, BCE-comes primarily from archaeology. Unfortunately, archaeology tells the story of the past based on material remains which means that these remains must have endured for thousands of years, then be found, and finally interpreted. As a result our picture of Florida, BCE is not complete, but rather a series of seemingly disjointed snapshots. When the Pilgrims first arrived in New England in 1620, they viewed the area as an undeveloped wilderness. One of their first activities was to rob Indian graves, taking from them, among other things, maize (commonly known as corn). While the Pilgrims relied on the produce from Indian farms-corn, beans, and squash-for their survival they failed to either see or understand the well-developed Indian agriculture which they encountered. In the centuries since the Pilgrims began their invasions, historians, politicians, pundits, and others have been unaware of Indian agriculture. Even the most casual tourist who travels through the Navajo lands of Arizona, New Mexico, Colorado, and Utah cannot help but notice the abundance of fine weavings commonly called "rugs" which are offered for sale at roadside stands, tourist traps, restaurants, museums, and fine arts galleries. Navajo weavings are some of the best-known and most easily recognized American Indian art forms. A number of different Indian cultures used long-distance signaling systems in war and in hunting. The most stereotyped of these is the use of smoke-signals. Unlike the Plains Indian Sign Language which facilitated intertribal communication, there was no standard set of meanings for the puffs of smoke used in smoke signals. Each tribe established its own set of signals. During the 18th and 19th centuries, the world of the American Indians who inhabited the Great Plains changed greatly. The first, and perhaps most significant, change began with the adoption of the horse following the Pueblo Revolt of 1680. 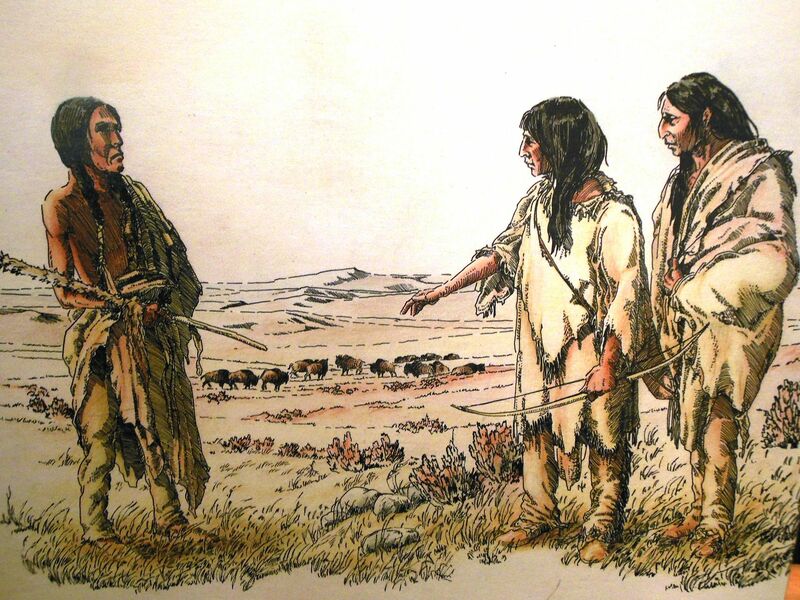 The horse not only extended the hunting range of the Indian nations which already inhabited the Plains, such as the Blackfoot and Crow, but it also brought a number of newcomers into the area. The increased number of tribes on the Plains not only spoke different languages, but their languages were often totally unrelated. Traditionally, the Indian nations of the Northern Plains, such as the Blackfoot, were egalitarian. Within Blackfoot society, there were no individuals, no groups of people, who were endowed by a god, creator, or other entity with any more rights than anyone else. As animists, they also viewed all other living things as people, as having souls. Within their egalitarian world-view, all people-humans, animal-people, plant-people, and others-were seen as equals. Humans did not have superior rights, they did not have dominion over the rest of creation. Humans tried to live in harmony with nature. 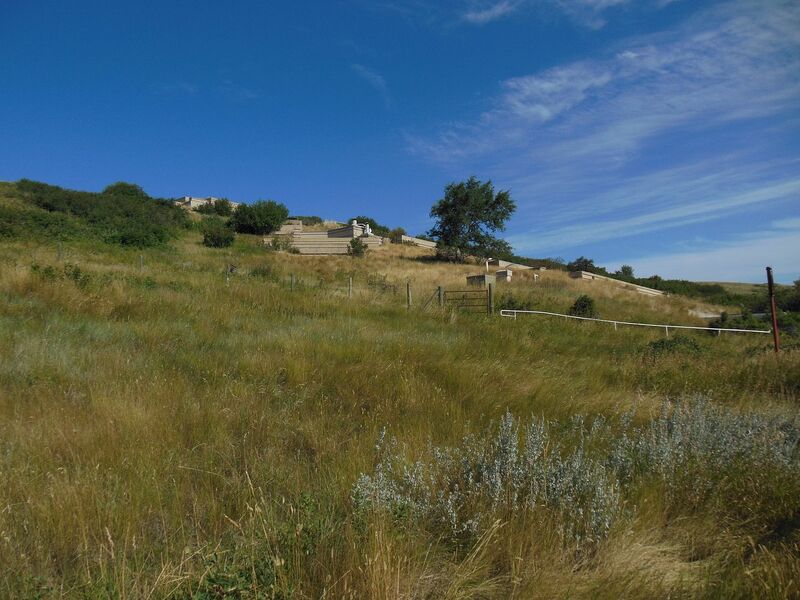 The Head-Smashed-In Buffalo Jump Interpretive Centre, located near Fort Macleod, Alberta, tells the story of the interaction between the buffalo-people and the Blackfoot. Visitors start their tour at the top of the seven-level building which is concealed in the ancient cliff face. 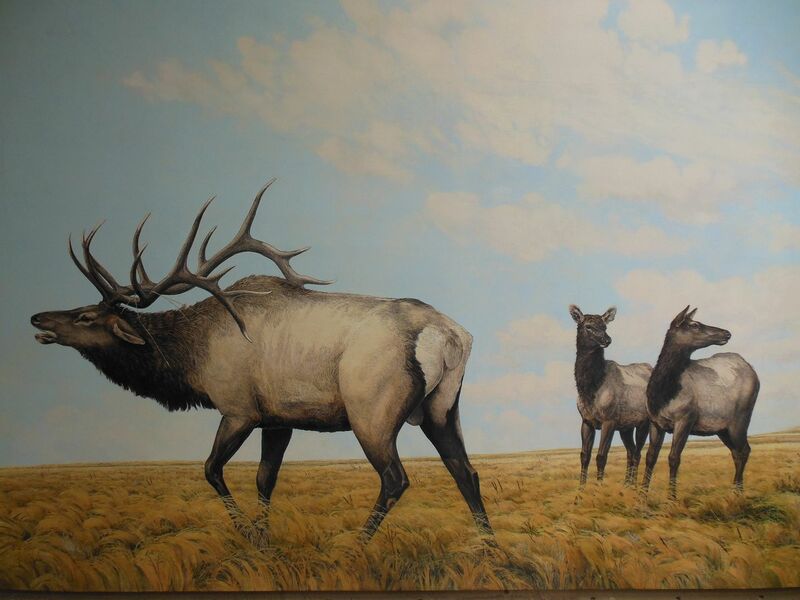 Napi's World, a series of displays on the first level, tells about the environment of southern Alberta and the people-animal, plant, and human-who inhabit it. Napi is a Blackfoot Culture Hero who transformed the world for the people. Photographs of Napi's World and other animal-people in the Centre are shown below. At the beginning of the European invasion of North America, there may have been as many as 75 million buffalo on the Great Plains. 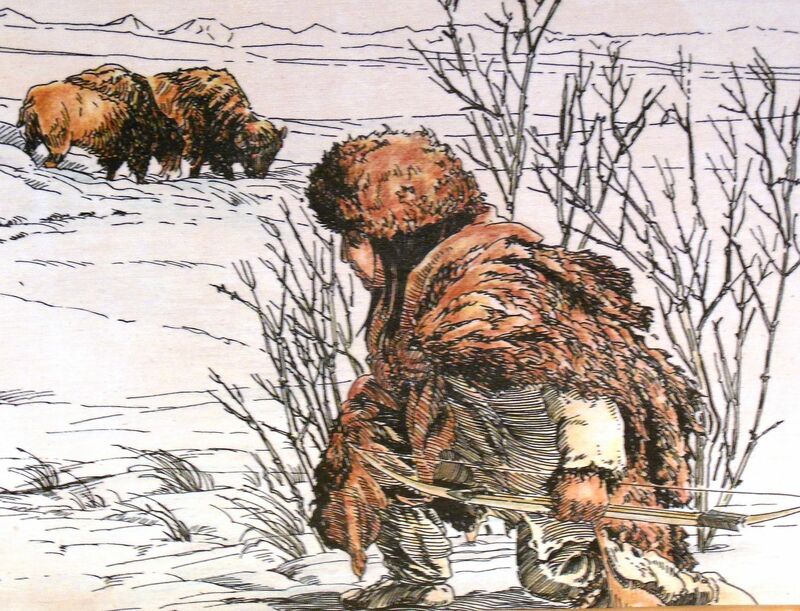 For thousands of years, the buffalo had been the walking supermarket of the Plains Indian people, providing them with food, clothing, tools, toys, and shelter. 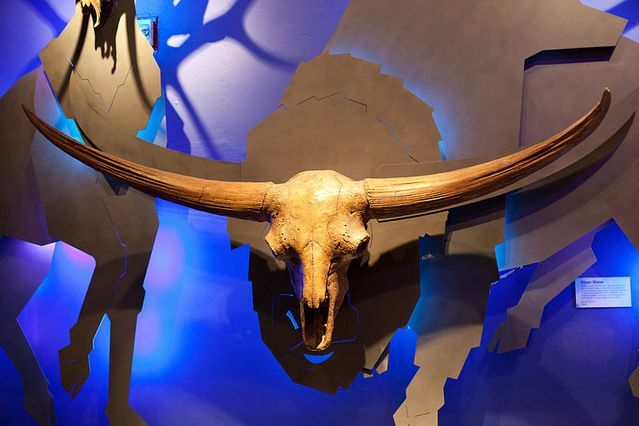 For most of the year, the buffalo provided the Plains Indians with most of their food, with durable hides for making tipi covers and blankets, and strong bones for making a wide variety of tools-at least 87 different tools according to one study. For the Plains Indians, hunting was not a choice, but a way of life, a strategy for survival. Technically, the animal is a bison, but it is commonly called a buffalo, particularly by Indian people. At the present time, there are two subspecies of bison in North America: plains bison (Bison bison bison) and wood bison (Bison bison athabascae). 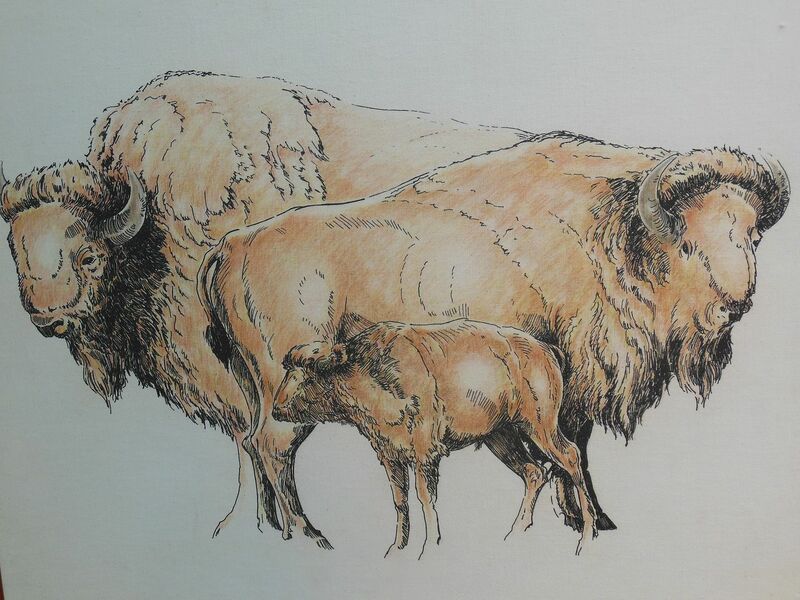 Over the past 10,000 years, the North American bison have been gradually decreasing in size. 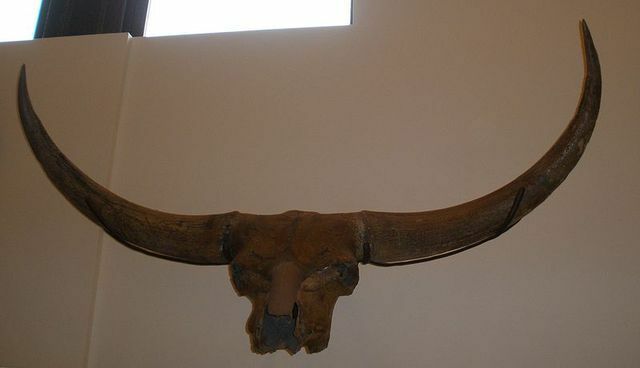 The now extinct Bison latifrons had an overall horn spread (including horn sheaths) in excess of two metres (more than six feet) as compared with about three-fourths of a metre for today's bison. Bison at the end of the ice ages 12,000 years ago were about 25% larger than the modern animals. 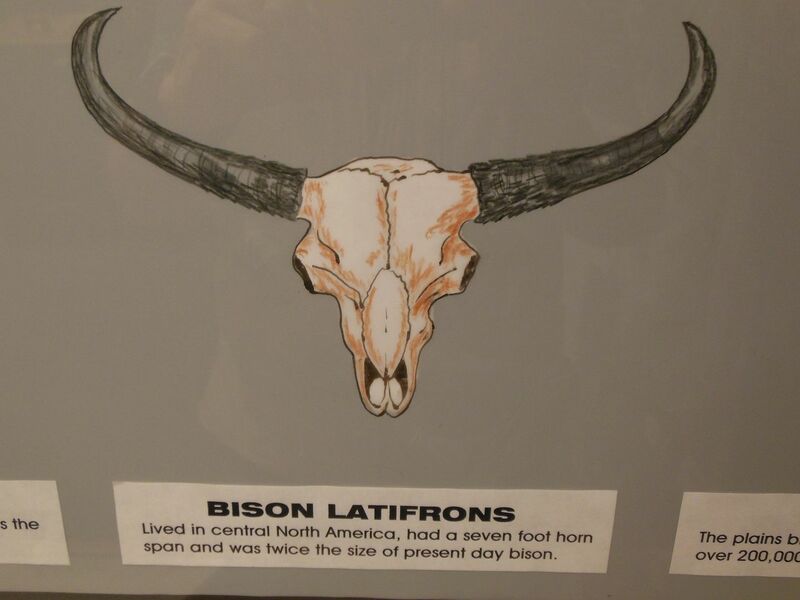 Shown above are skulls from Bison latifrons. "They can turn on a dime, twirling with their heads down and horns out. 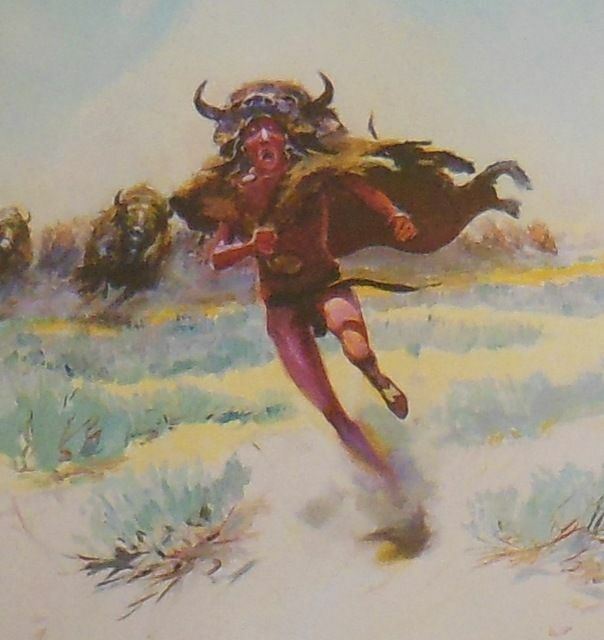 Many a coyote, wolf, and human hunter have been bore and flung through the air by a buffalo that just a moment before had been standing still." 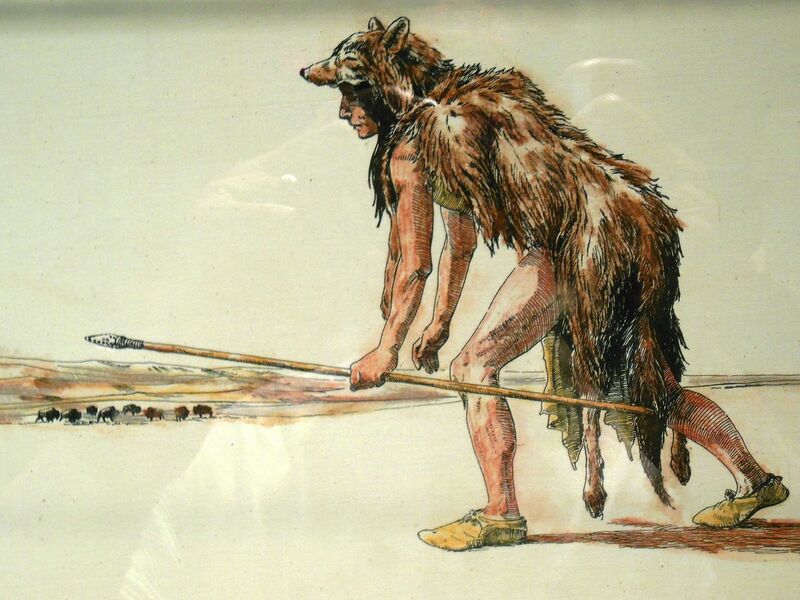 For the Indian hunters, the thing that made one buffalo better than another was the amount of fat that the animal had. Thus, hunters were able to pick out the fattest animals in the herd by looking at their curves and the sheen of their coats. 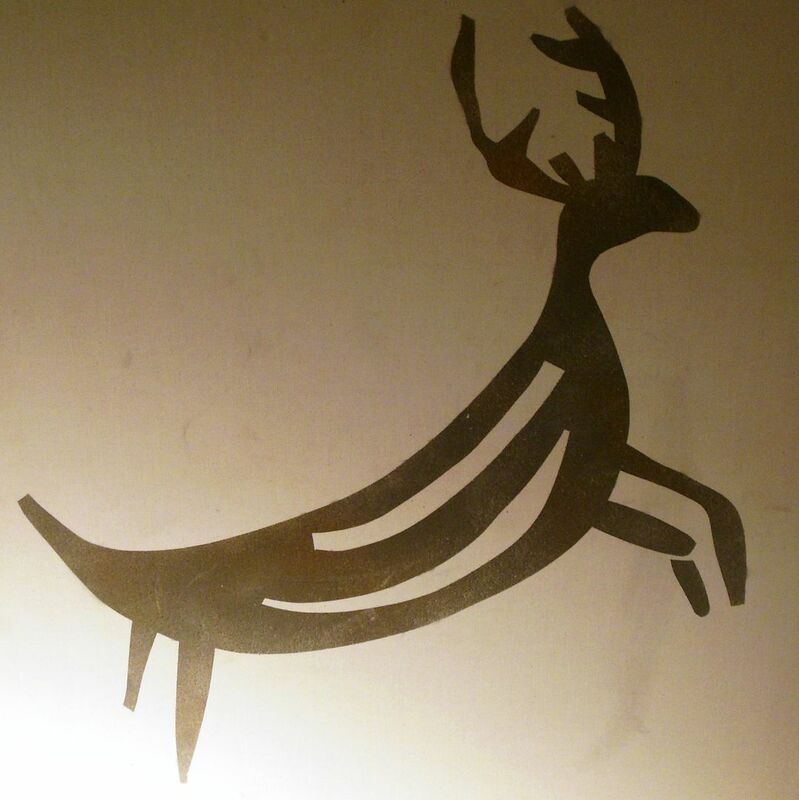 They also knew which animals would be fat at any given time of year. Maximizing fat meant that Indian hunters harvested cows for much of the year. Only in the summer would bulls be a preferred target. 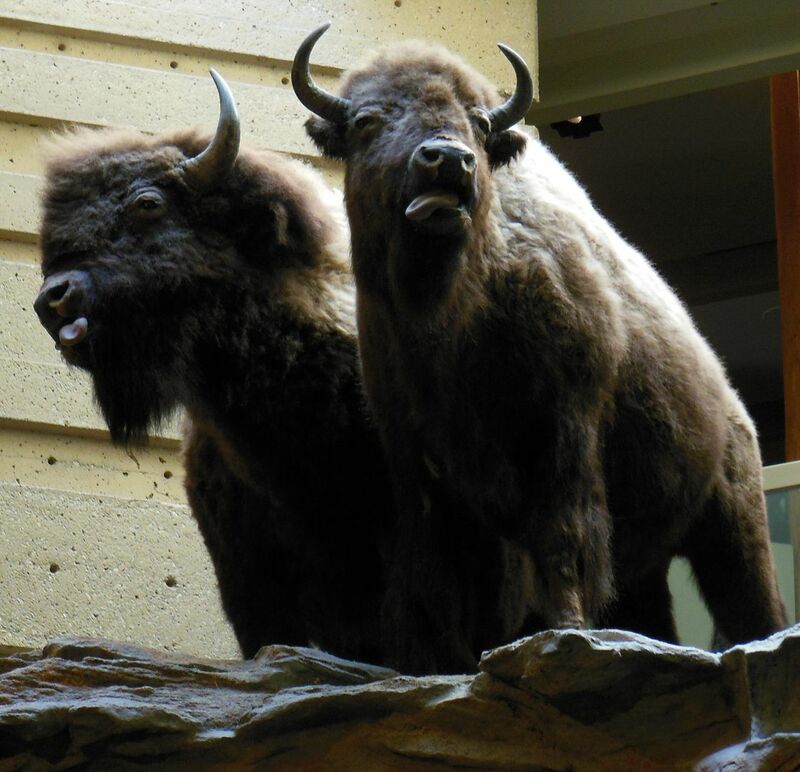 Indians hunted buffalo in many different ways, ranging from communal hunts in which many different groups would come together to harvest a hundred animals at a single time using a buffalo jump or a pound, to solitary hunting in which only a few animals would be taken. Indian people managed the environment to enhance the herds and to position them. Long ago Indian people had learned that if the grasslands were burned off, then it would come back greener and more nutritious as the burned grass provided fertilizer to the soil. They knew that the buffalo were attracted to these greener, freshly burned areas. In the fall and in the spring, fires would be intentionally lit so that the buffalo would be attracted into these areas. One of the ways Indian people hunted buffalo was to drive them over a cliff. 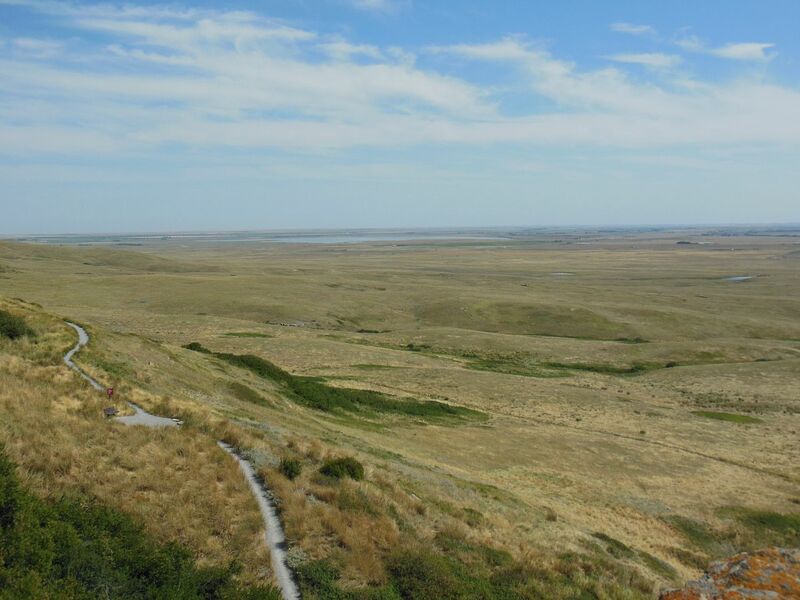 Scattered across the Northern Plains are thousands of these buffalo jump sites. Many of them were used only once, while others were used repeatedly. "Not only were buffalo jumps an extraordinary amount of work; they were the culmination of thousands of years of shared and passed-on tribal knowledge of the environment, the lay of the land, and the behavior and biology of the buffalo." 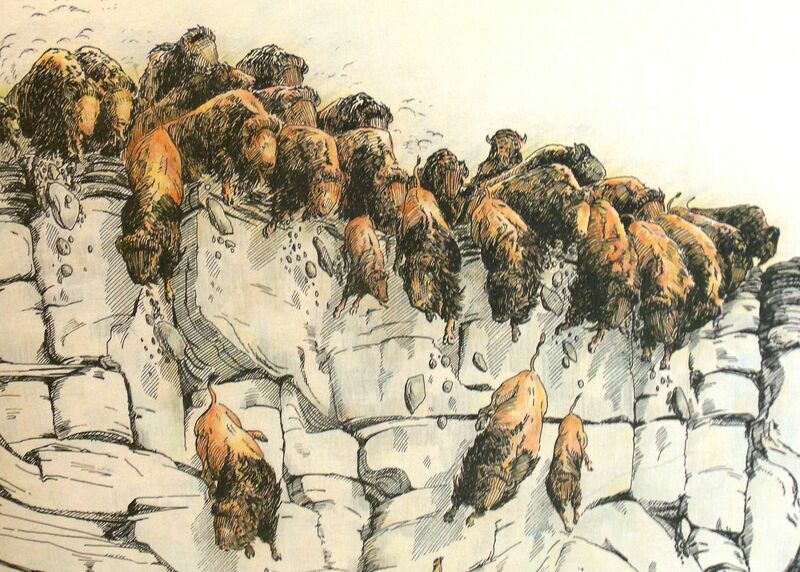 The first problem in using a buffalo jump is that the buffalo herd is usually not close to the kill area. The herd must be lured over a distance of many miles to the cliff. To help lure the herd, a young man would dress up like a buffalo calf. He would then approach the herd, mimicking calf behavior. He would have to make the calls of a buffalo calf-not just any calls, but those made by a calf in distress. Other young men, dressed as wolves and mimicking their behavior, would appear in the prairie behind the herd and create an illusion of danger. Slowly and patiently these buffalo runners would lead the herd toward the kill site. Being a buffalo runner was a hazardous occupation and many were killed or maimed. 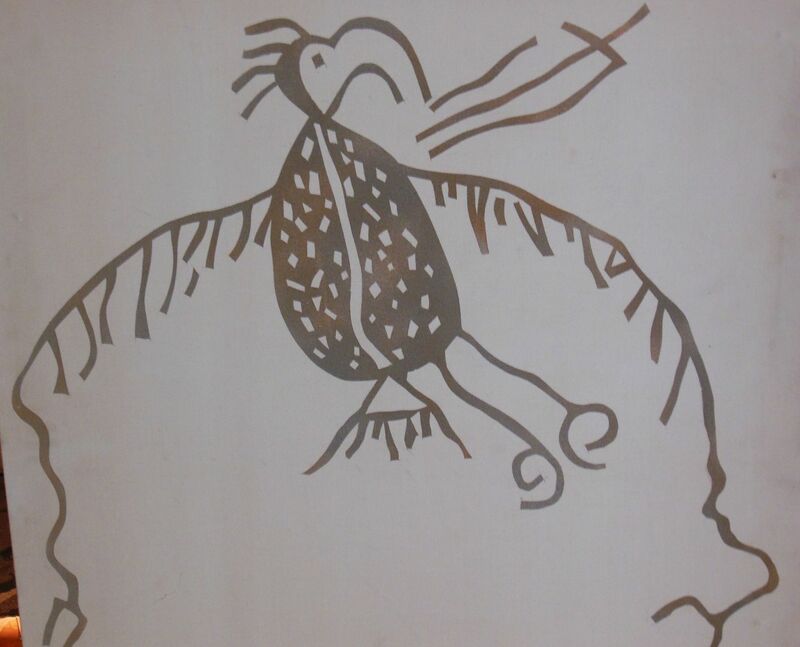 The painting of a buffalo runner shown above is on display at the First Peoples Buffalo Jump in Ulm, Montana. Stretching back for many miles into the prairies behind the cliff are the drive lines which will guide their herd. These are marked with stone cairns which can be used as a base for wedging in the ends of sticks and brush. This helps create the illusion, from the perspective of the buffalo's poor eyesight, of a wall or barrier. In the drawing above, the dotted lines show the drive lines for the Head-Smashed-In and Calderwood buffalo jumps. 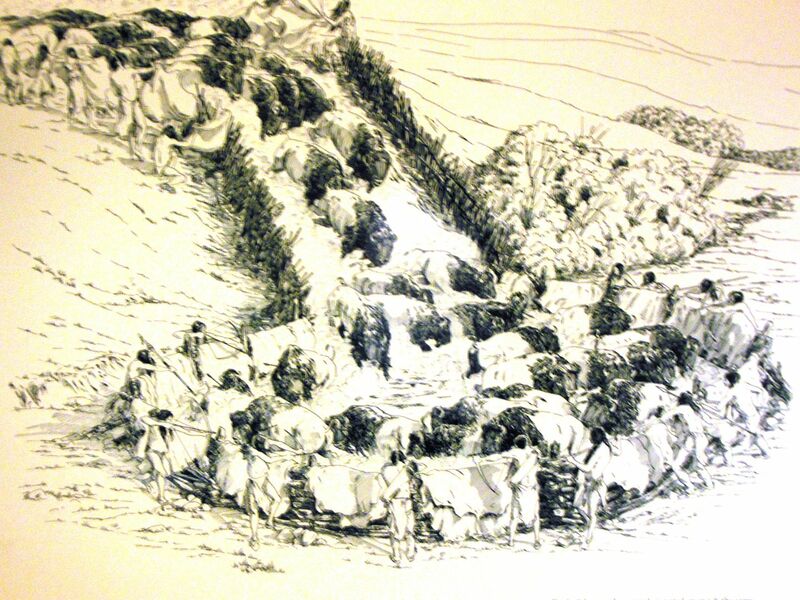 The drawing above, from the Head-Smashed-In Buffalo Jump Interpretive Centre, shows the drive line cairns being prepared for a buffalo hunt. The buffalo pound was a way of harvesting large numbers of bison in a similar fashion to the buffalo jump. 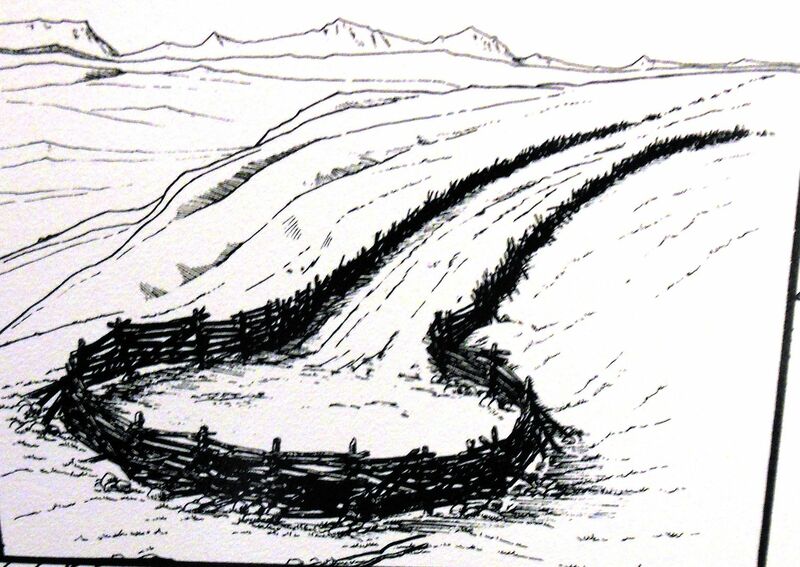 However, the final kill location was not a cliff, but rather a pound or corral made of wood. Pounds were located in the lightly wooded areas that surround portions of the Great Plains. Here the hunters could find enough wood to build the pound. 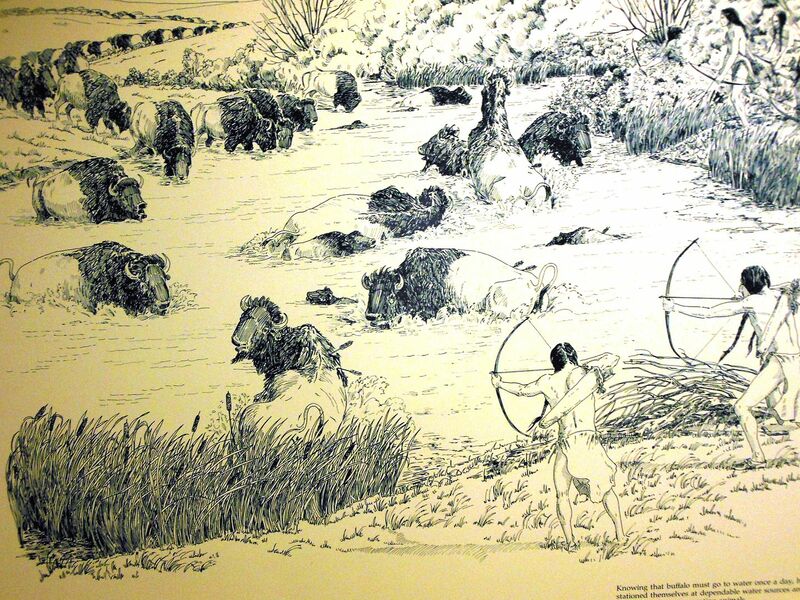 Using techniques similar to those used in the buffalo jump, the herd would be lured over many miles and then driven into the pound where they would be killed with bows and arrows and spears as they milled around. Pound is from an archaic English term for enclosure. The wooden structure of the pound was actually somewhat flimsy by modern standards. The walls were draped with bison hides, the darker sides facing in, creating the illusion of a solid surrounding wall. Once in the corral, the animals saw only solid darkness surrounding them and no visible escape. Thus they simply circled in the confines of a structure which they could have easily destroyed. During much of the year, Indian people would hunt buffalo in small groups or alone. A solitary hunter might use a disguise to get close to the herd and take an animal or two. Small groups of hunters from the same band might take five or ten animals. The camp would then move to the kill site to process the carcasses rather than transport them back to camp. In the winter, hunters wearing snowshoes would drive the buffalo into snow banks where the animals would become mired down and thus could be easily killed. At other times they waited at watering holes where the buffalo would become less mobile because of the mud. Sometimes they would set ambushes along the well-used buffalo trails or hunt them as they swam across rivers and lakes. 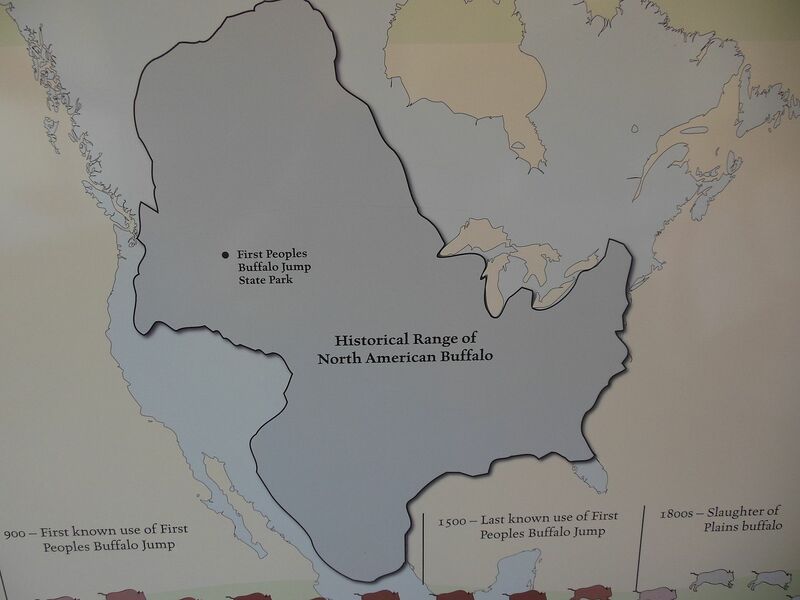 There are probably thousands of buffalo jumps scattered across the Northern Plains. 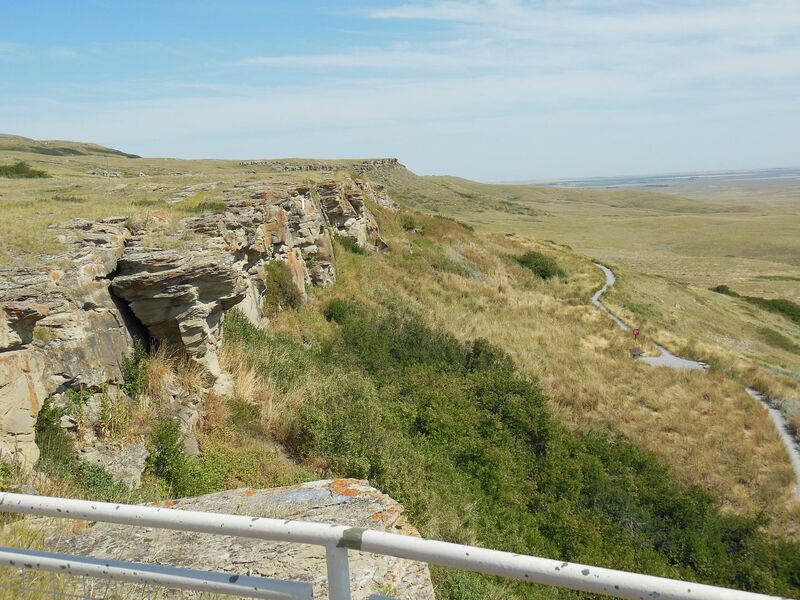 The Head-Smashed-In Buffalo Jump, a UNESCO World Heritage Site, is one of the oldest, largest, and best preserved buffalo jumps in North America. 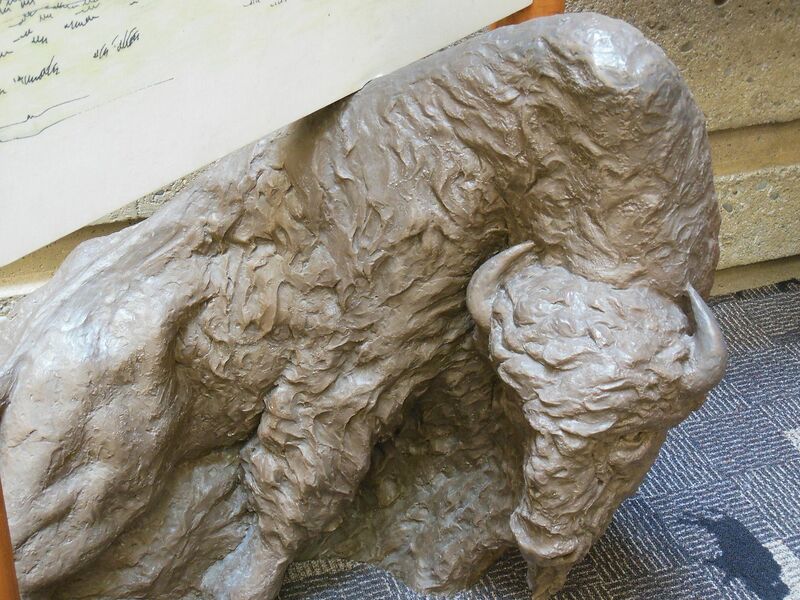 Located about 18 kilometers from Fort Macleod, Alberta, Canada, the site tells of the story of the First Nations and the buffalo for 6,000 years. Head-Smashed-In takes its name from the story of a young Peigan boy who stood under the cliff to get a better view of the buffalo falling over the cliff. The young man was soon crushed under the pile of dead buffalo. While Indian people have inhabited the area around Head-Smashed-In for more than 11,000 years, it did not become designated as a National Historical Site until 1968. The interpretive centre was officially opened by the Duke and Duchess of York, Prince Andrew and Sarah Ferguson, in 1987. The interpretive centre at Head-Smashed-In is an architectural delight and wonder by itself. It is built into the side of the cliff in an unobtrusive and aesthetically pleasing way. The architect, Robert LeBlond, received the Governor General's Award for Architecture in 1990. 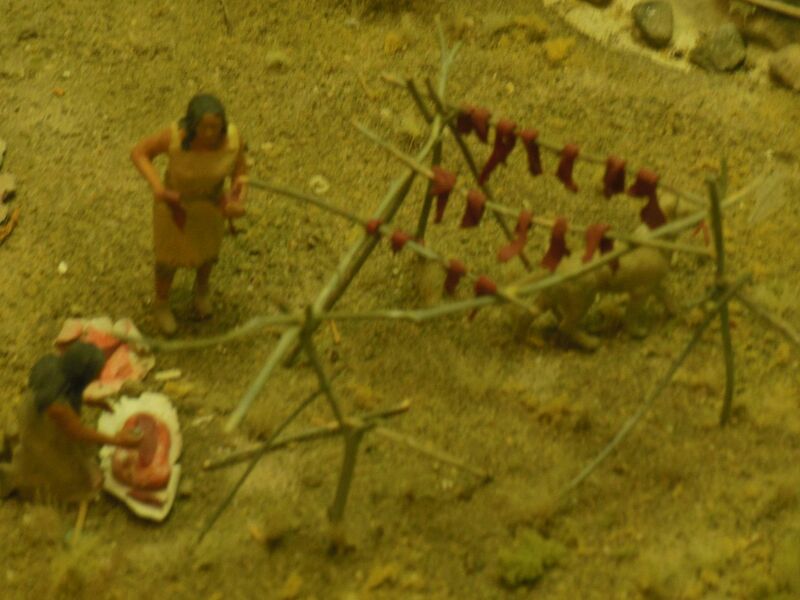 "Built adjacent to the actual archaeological site, the Head-Smashed-In Interpretive Centre is a premier example of in situ interpretation of an archaeological resource in North America." The Centre's parking area, which seems quite awkward for the visitors, was positioned so that it did not disrupt any archaeological materials. The interpretive centre at Head-Smashed-In has seven levels. The top two levels provide access to the trail at the top of the cliff and views of the area. The upper trail leads from the interpretive centre along the top of the cliff to the kill site. The lower trail can be seen in the photos. 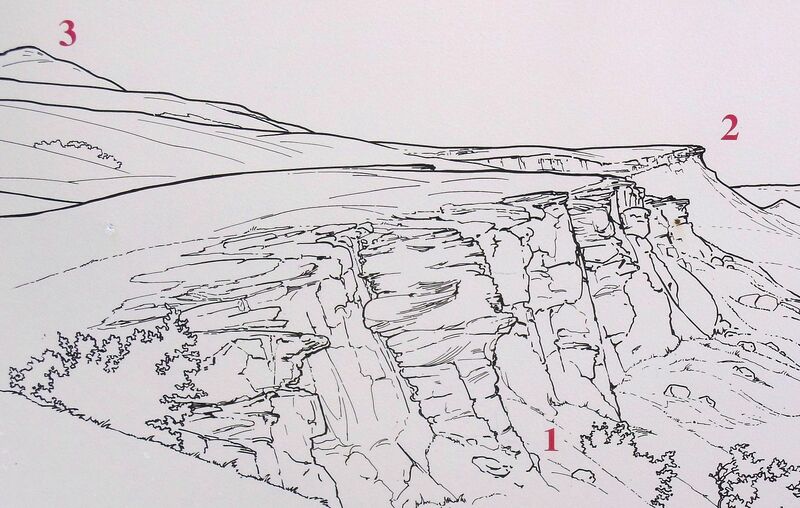 The drawing above shows the location of the kill site (designated as 1), a second buffalo jump (the Calderwood Jump, designated as 2), and a vision quest site (designated as 3). 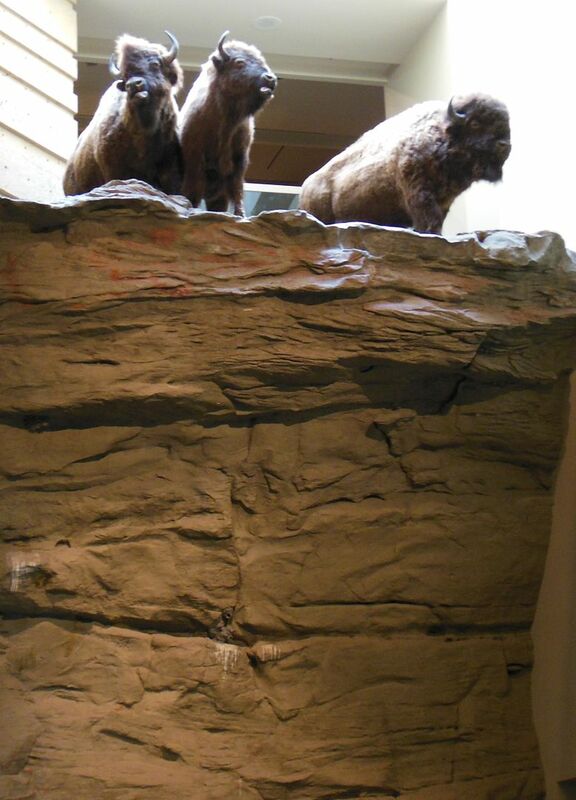 A cast of the Calderwood Buffalo Jump is the cliff face which is on display inside the Interpretive Centre. 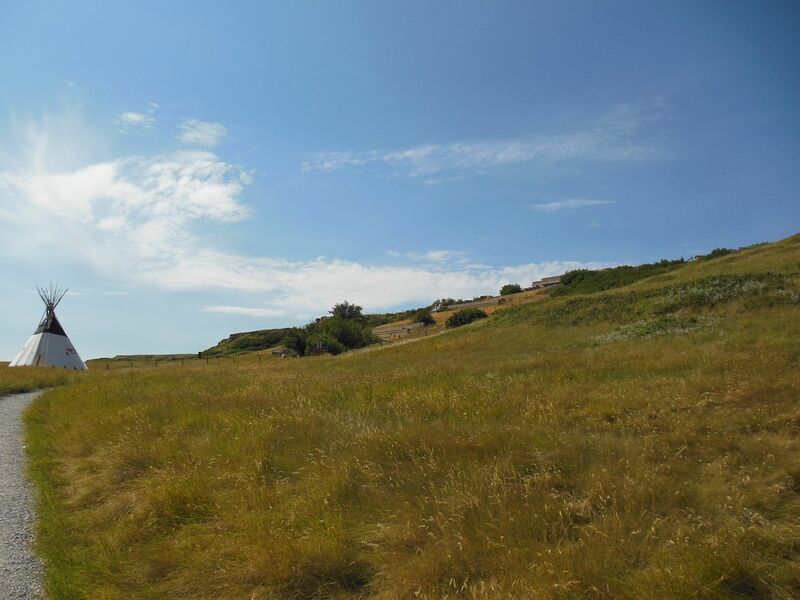 The view looking back from the cliff toward the prairie is shown above. 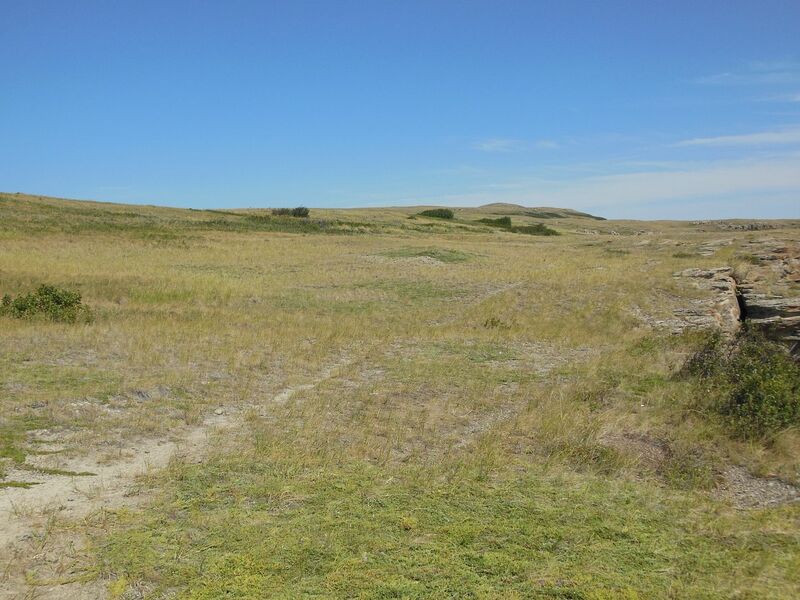 The grass cover of the massive basin behind the jump is dominated by blue gamma and rough fescue. Both of these grasses are especially high in protein and are thus excellent graze for fall and winter. 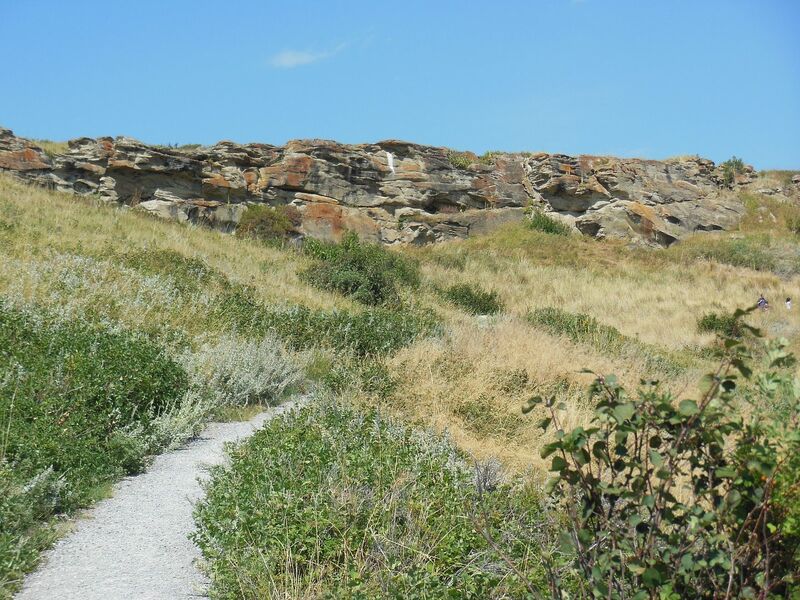 The buffalo jump was used primarily in the fall. The lower trail goes past a tipi and then below the cliffs. 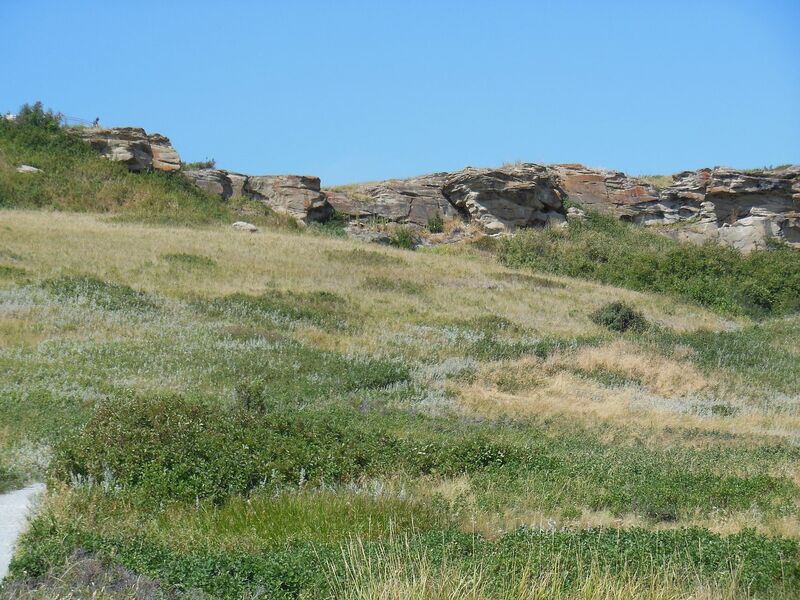 At present the cliffs are about 10 meters (33 feet) high, but when the buffalo jump was first in use the cliffs were about 20 meters (66 feet) high. Each of the other five levels tells a different aspect of the area's rich history. The interpretation is detailed and is told from the perspectives of Blackfoot elders and archaeology. For the Plains Indians, for many thousands of years, the buffalo (more properly called bison) was a walking supermarket providing them with food, clothing, shelter, tools, and toys. Buffalo were hunted in many different ways: they were killed as they swam across rivers and lakes; they were driven into snow banks where their short legs failed them; they were driven into dead-end canyons where they were easily cornered; they were ambushed as they migrated along well-marked trails; they were herded into corrals; and they were driven over cliffs. Once the buffalo had been harvested, the carcass had to be fully butchered and processed into usable food fairly quickly or it would spoil. 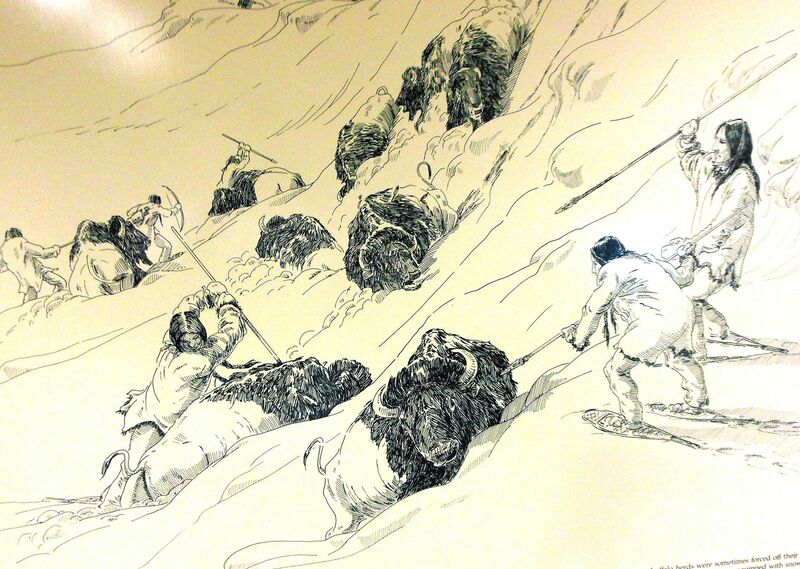 In a communal hunt, such as a buffalo jump, processing the carcass was done with an assembly line. Removing the hide and emptying the stomach were crucial in cooling down the carcass and ensuring that the greatest amount of food could be saved for future use. In butchering a buffalo, the tongue and internal organs were removed first. These were taken to the camp's medicine people and then eaten as delicacies. As the people butchered the carcass-a process which would go on around the clock until it was done-they would smash the big marrow bones with heavy stone hammers to extract the tasty and nutritious marrow. This would help replenish the energy of the workers. The body would be cut into 11 pieces to facilitate transportation: the four limbs, the two sides of ribs, the two sinews on each side of the back bone, the brisket, the croup, and the back bone. Bison meat is about 65% water, so the Indians would dry the meat to make it lighter and easier to carry. In order to get rid of the moisture, the meat would be cut into thin strips, thus exposing a great deal of the surface area to the drying effects of the sun and air. The thin strips of meat would be hung on simple wooden racks for drying. Drying the meat in very thin strips is also a method of preserving it. The dried meat would be stored in hide containers known as parfleches. Parfleches were made from stiff, untanned hides that were folded into a large envelope. The food would be packed in the parfleche as tightly as possible to keep out as much air as possible, thus reducing spoilage. Properly cured and packaged dried meat could last for months, and even years. The hides would be processed into robes or tanned hides for lodge covers or clothing. One of the common methods of cooking is known as stone boiling. A bowl-shaped pit would be dug into the hard earth. 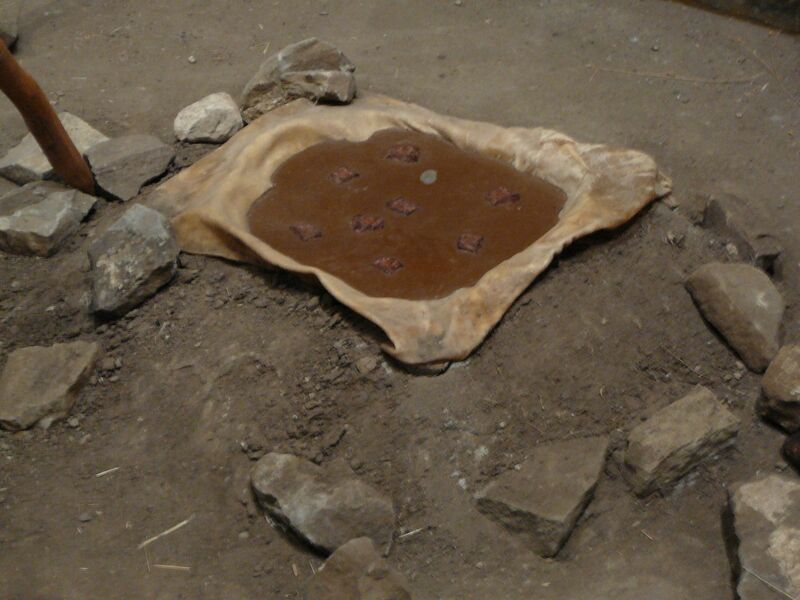 It would then be made watertight by pushing a fresh buffalo hide, fleshy side up, into the bottom of the pit. The pit would then be filled with water. Large heavy cobbles would be heated in a nearby fire until they glowed red. They would then be carried on a forked stick to the pit. By continually replacing the rocks as they cooled with hot rocks, the water would get very hot. Food would then be added and cooked. 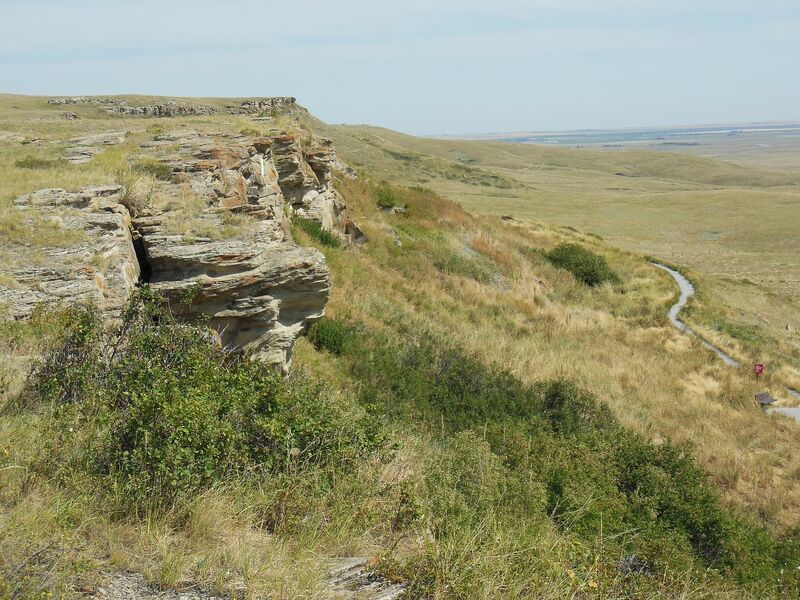 At the Head-Smashed-In Buffalo Jump in southern Alberta, the local stone was not suitable for heating for this process and so the cobbles were brought in from some distance away. 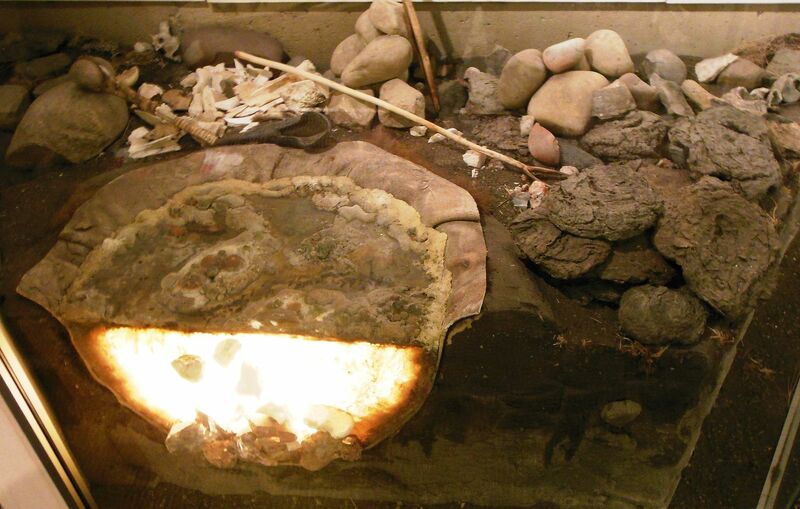 This diorama at the Head-Smashed-In Buffalo Jump shows the use of stone boiling to render fat from the bones. Notice that the material stacked up on the right is buffalo dung (commonly called buffalo chips). Since trees tend to be scarce on the Great Plains, dried buffalo dung was the standard fuel used by the Plains Indians. 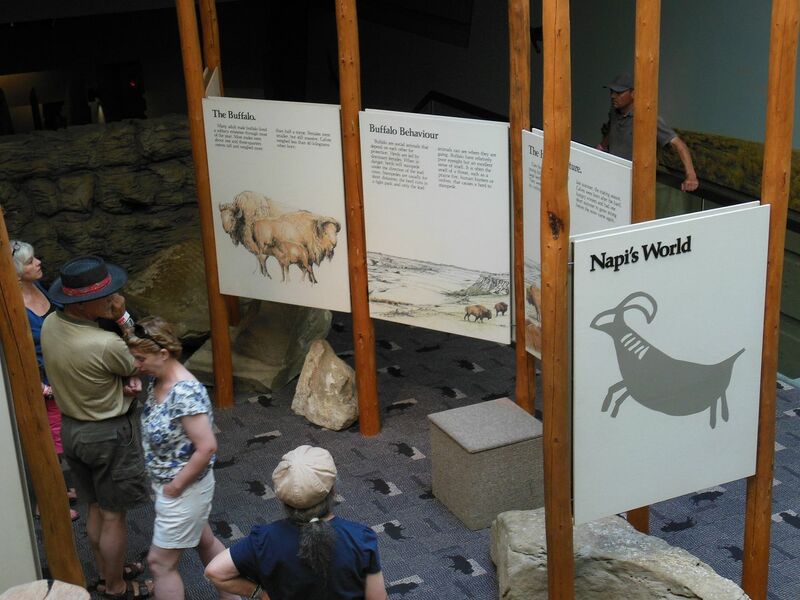 This display at the First Peoples Buffalo Jump in Ulm, Montana shows stone boiling. Grilling meat on a spit over an open flame was a quick, easy way to cook buffalo. It was often done, but it was not the preferred way of cooking. 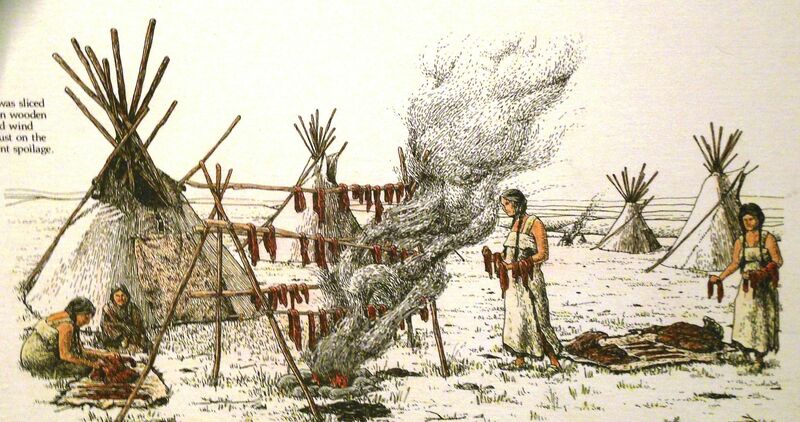 Native Americans viewed grilling as an inferior way of preparing meat as it resulted in the loss of much of what makes meat so great to eat: fat. 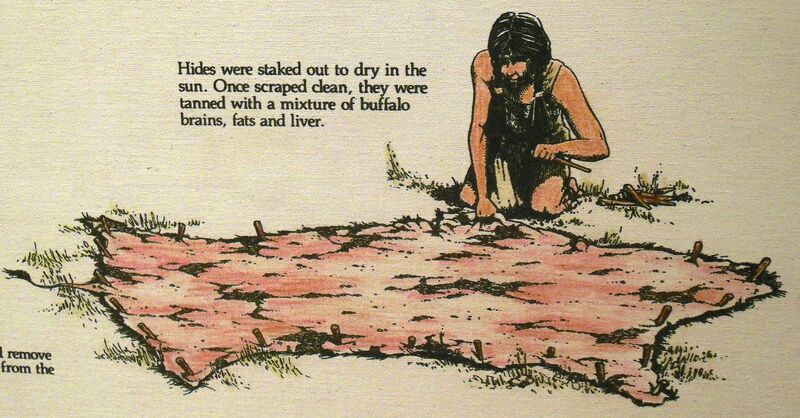 A common way of cooking buffalo involved earth ovens. A pit-deeper and with steeper sides than the pit used for stone boiling-would be dug. In many cases this pit would be shaped like an inverted bell. Rocks would be placed at the bottom of this pit. At Head-Smashed-In, local sandstone was used for this. In some cases the rocks would be heated before being placed in the pit and at other times a fire would be built over the rocks in the bottom of the pit to get them red hot. Once the hot rocks were ready, the meat would be added. Usually, the meat would be wrapped in a covering of either hide or local vegetation to keep the meat from getting covered in dirt. At Head-Smashed-In, the local vegetation was small branches of local willows, Saskatoon bushes, or conifers. Dirt was then piled on top of the protected meat and a fire was built over the pit. After several hours, sometimes the next day, the pit would be uncovered and the people would feast. Personal note: I had buffalo prepared this way at the Kalispel Powwow many years ago. It was the best buffalo I have ever tasted, and I have eaten a lot of buffalo. Making pemmican out of buffalo is a way of preserving it so that it can be stored for a very long time. 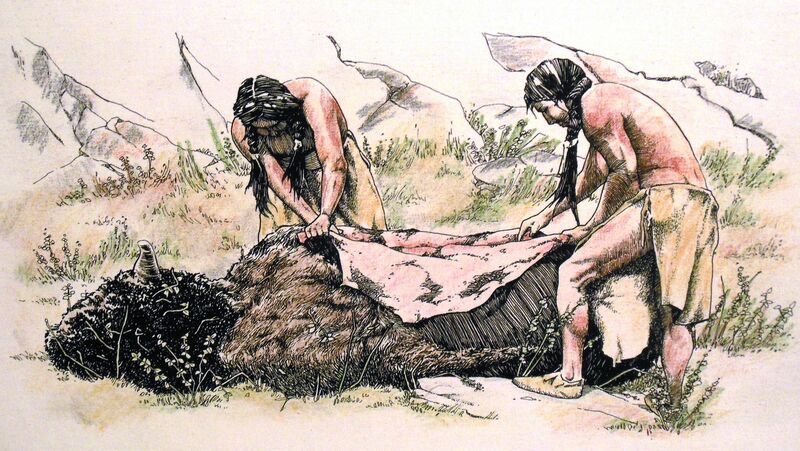 Once the flat sheets of meat have been thoroughly dried, they can be used in making pemmican. Using stone hammers, the meat would be reduced to almost a powder, then mixed with fat. Berries would then be added to the mixture. On the Northern Plains, Saskatoon and chokecherries were most frequently used. 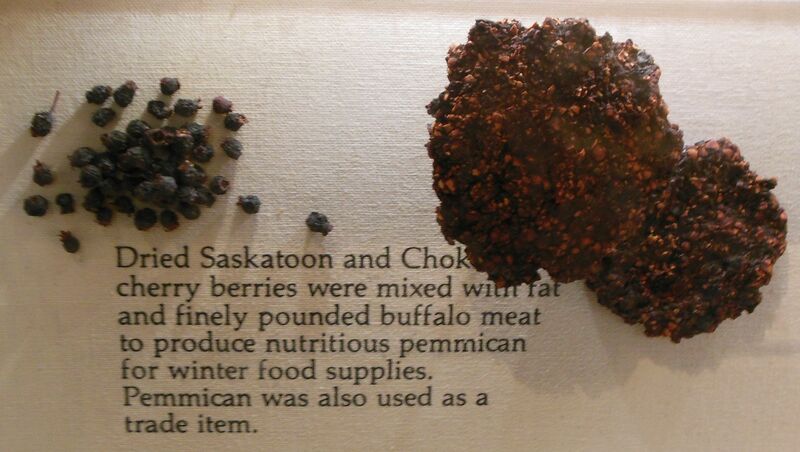 Dried Saskatoon and Choke Cherry berries were mixed with finely pounded buffalo meat to make pemmican. 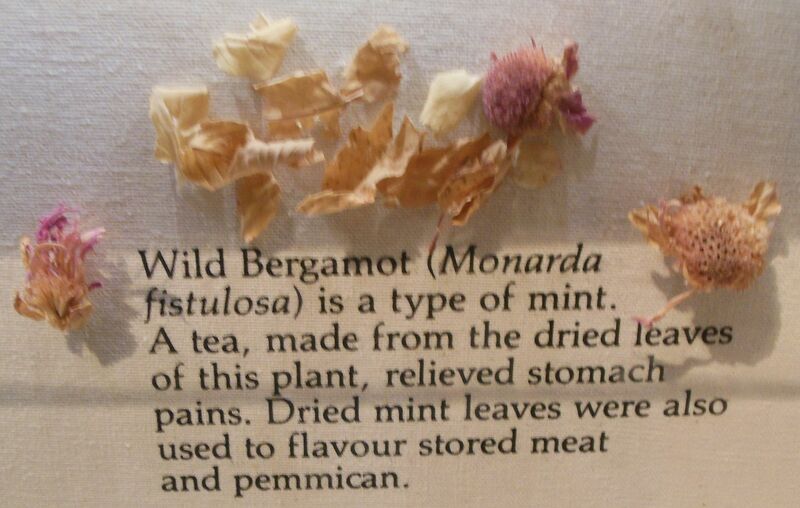 At times, wild Bergamont would be added to the pemmican for additional flavor. When all of the ingredients-powdered meat, fat, berries, and other flavorings-had been thoroughly mixed, the mash was then placed in heavy bags made of buffalo hide. These bags were made from several pieces of hide sewn together to make a large sack which would hold 40 to 50 kilograms (88 to 110 pounds) of pemmican. In the dog days prior to the horse, the bags would have been somewhat smaller. Pemmican is a dense, nutritious, storable food that often served as a staple. Later, during the fur trade era, pemmican became the staple of the fur trappers and both Indians and Métis produced it as a trade good. The most celebrated event in American history is the Civil War. Each year, thousands of people dress up in period costumes and reenact popular battles. The American landscape is littered with state parks, national parks, and historic markers celebrating the Civil War. This war not only divided the Americans, but also the Indians, particularly those living in Oklahoma. Many of the tribes, such as the Cherokee and the Creek, were divided between their loyalties to a slave-owning confederacy and to the federal government. One of the early battles in the Civil War which involved Indians occurred in Arkansas in 1862 at a place known as Pea Ridge. Nearly a century later, in 1956, the Arkansas congressional delegation proposed legislation to make this battlefield a national military park. 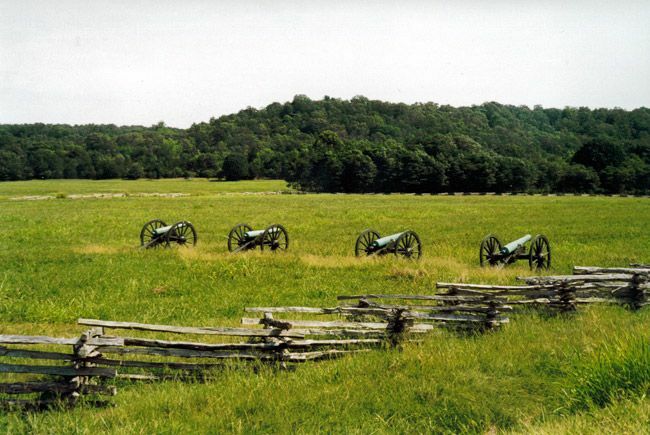 Congress responded by passing the act which created the Pea Ridge National Military Park. The Pea Ridge National Military Park is shown above. The Confederate monument at Pea Ridge is shown above. 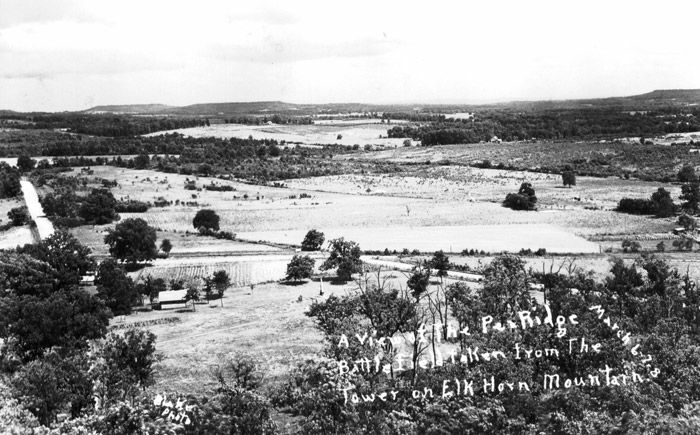 Long before the Pea Ridge battlefield was declared a national monument, many Union and Confederate veterans attended reunions at the site. The first of these was held in 1887, some 25 years after the battle. 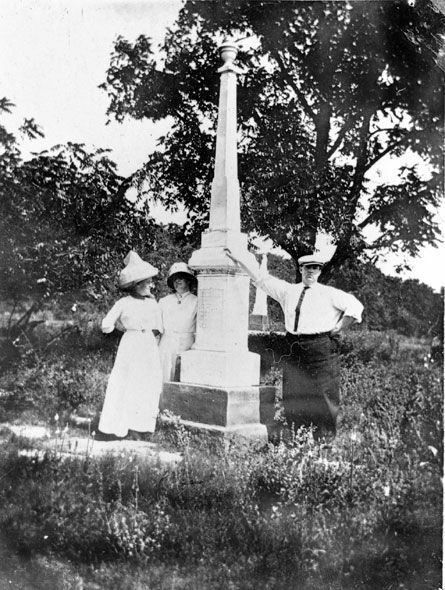 The veterans dedicated monuments on the battlefield to both the Union and Confederate dead. Prior to the Civil War, the Cherokee in Oklahoma were a deeply divided nation. 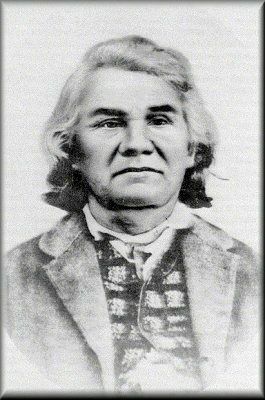 The Civil War exacerbated this division: John Ross, a slave owner and principal chief, supported the Union and spent the war attempting to lead a government in exile; Stand Watie, a southern sympathizer, replaced Ross as principal chief and led Cherokee troops for the Confederacy. Stand Watie, who held the rank of Colonel in the Confederate Army, formed the 2nd Cherokee Mounted Rifles and commanded this regiment at Pea Ridge. At the Battle of Pea Ridge almost 1,000 Cherokee made up two Confederate regiments. These Indian regiments were a part of the division commanded by General McCulloch. In spite of the fact that the Union forces were outnumbered and outgunned by the Confederates, the Battle of Pea Ridge was a decisive victory for the Federal Army. After the battle, Watie commanded a brigade of Native American troops. He led his troops in 18 battles and major skirmishes. In 1864, he was promoted to the rank of Brigadier General. When he surrendered to Federal troops in June 1865 he was the last Confederate general to surrender. General Stand Watie is shown above. Shown above are Cherokee Confederates at a 1903 reunion. The Pea Ridge National Military Monument is also a part of the Cherokee Trail of Tears. A portion of the pre-war Old Telegraph/Wire Road in the Monument includes 2.5 miles of the Trail of Tears. In 1838, the United States Army rounded up the Cherokee in Tennessee, Georgia, North Carolina, and Alabama and then force-marched them 1,500 miles to Oklahoma. The Trail of Tears - called Nunna daul Isunyi in Cherokee which means "trail where we cried" - resulted in the death of an estimated 8,000 Cherokees. The Cherokees were forced to abandon their property and their unharvested crops. Mounted soldiers, using their bayonets as prods, herded the Cherokee like cattle. The Cherokee were removed in 13 different groups which traveled by different routes. 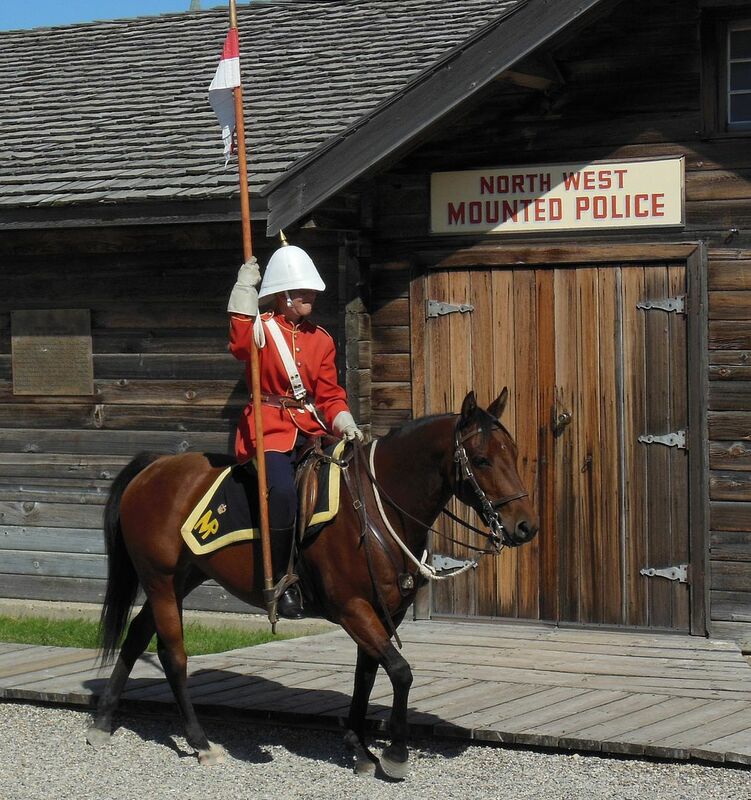 The North-West Mounted Police (NWMP) was formed in 1873 to administer law and order in the Northwest Territories (present day Alberta and Saskatchewan). The Mounties, as they came to be called, used consultation and negotiation to avert conflict rather than seek it. In Alberta, one of the concerns was to put a stop to the illegal liquor trade to the Blackfoot and other Indians. 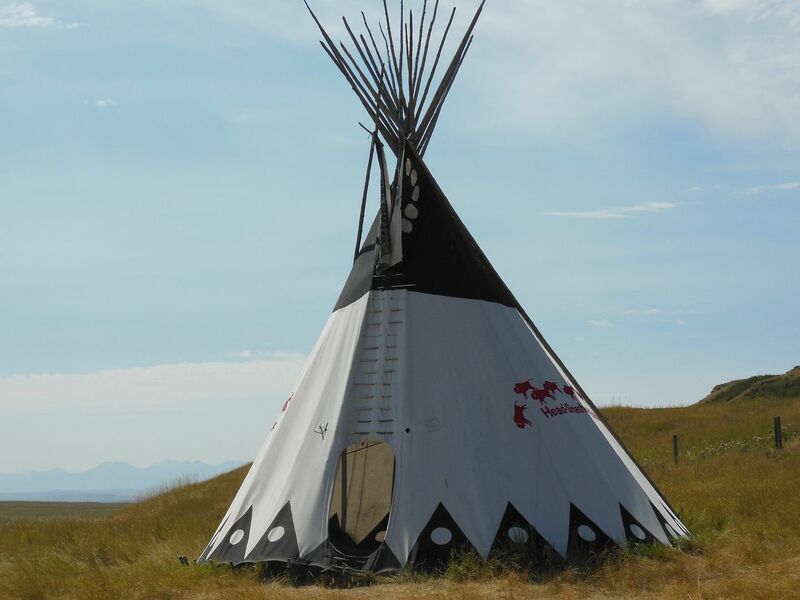 The infamous Fort Whoop-up, located in Alberta, supplied whiskey to both Canadian and American Indians. Shortly after the establishment of Fort Macleod in Alberta, five men were arrested and tried for having liquor in their possession. This resulted in fines and confiscation of their equipment and supply. The arrest of the whiskey traders had an immediate effect upon the relationship between the NWMP and the First Nations peoples. Within a year, the whiskey trade had stopped. With the sale of alcohol halted, the Indians made rapid strides in restoring order to their lives and replenishing their horse herds. "My brother, your words make me glad. I listened to them not only with my ears but with my heart also. In the coming of the Long Knives, with their firewater and quick-shooting guns, we were weak and our people have been woefully slain and impoverished. You say this will be stopped. We are glad to have it stopped. We want peace. What you tell us about this strong power which will govern good law and treat the Indian the same as the white man, makes us glad to hear. My brother, I believe you, and am thankful." Unlike the American military approach to Indians which relied on hard power (i.e. the use of superior numbers and firepower) to force Indians to their will, the NWMP sought a semblance of fairness in their dealings with the tribes. 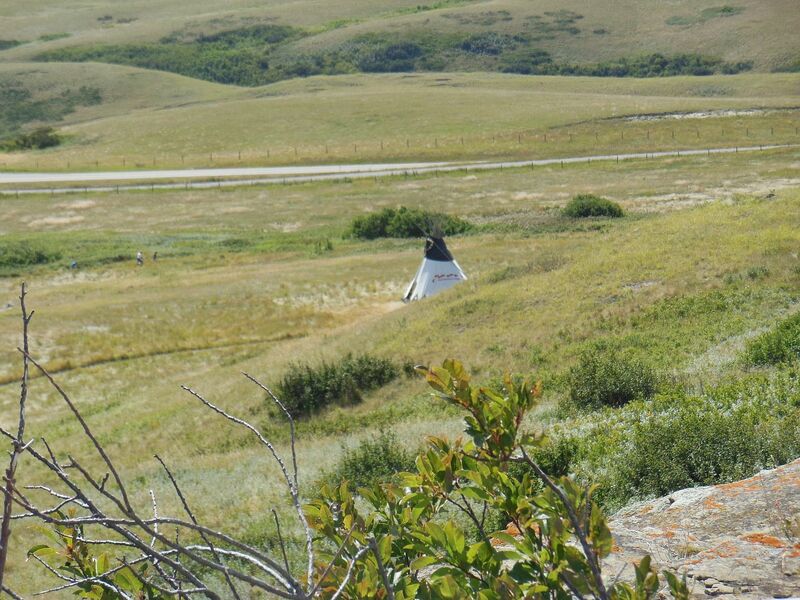 Unlike the situation south of the border, the NWMP administered justice for both Native peoples and non-Native peoples. While crimes against Indians in the United States were ignored by authorities, the NWMP sought justice regardless of whether the victim was Native or non-Native. By 1876, the North-West Mounted Police were operating out of four stations and collateral outposts. Fort Macleod was built in southern Alberta to offset American incursions in the whiskey and fur trade. 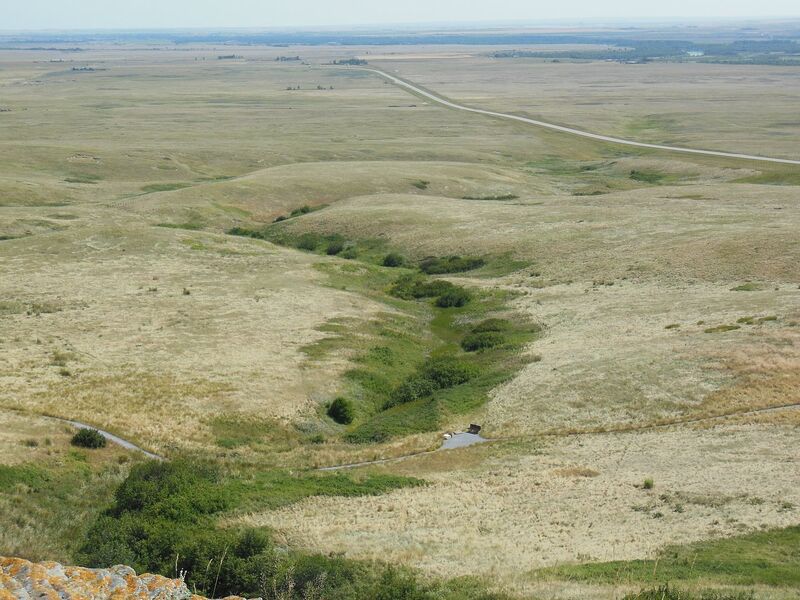 Fort Walsh was established 160 miles to the east, just across the provincial border in Saskatchewan. The presence of Forts Macleod and Walsh virtually ended the liquor traffic within a year. Following the Battle of the Little Bighorn in Montana, a number of Sioux fled into Canada to escape the American army. 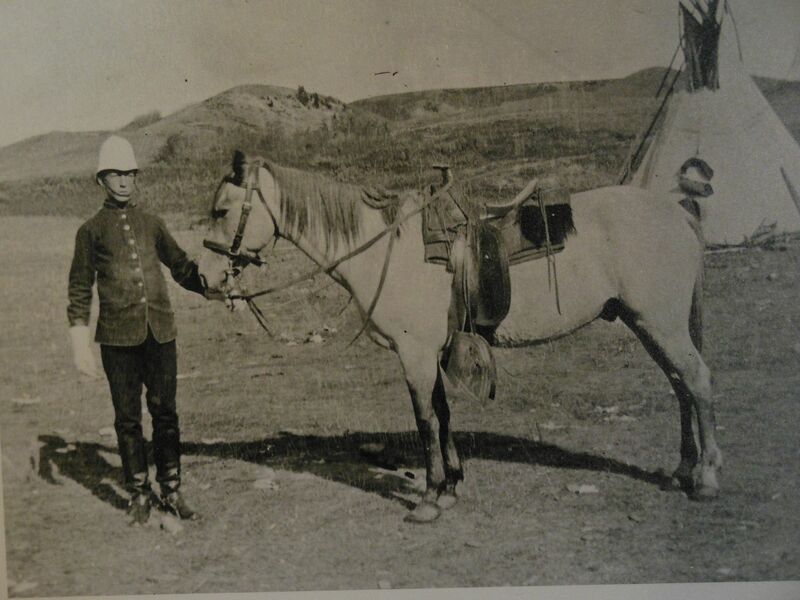 In Saskatchewan, North-West Mounted Police superintendent James Walsh visited the Sioux refugees at Wood Mountain. He estimated that the group had 2,900 people (500 men, 1,000 women, and 1,400 children), along with about 3,500 horses and 30 U.S. government mules. The Indians told him that they were looking for peace and that they had been driven from their homelands by the U.S. army. Walsh instructed the Indians on the law as it would affect their stay in Canada and was assured by the chiefs that they would not use Canada as a base for renewed hostilities against the Americans. In 1877, Four Horns, a civil and spiritual chief, led his Sioux band of 57 lodges across the border from the United States seeking refuge in Canada. Traveling with them was a band of Yanktonai under Medicine Bear from the Fort Peck Agency in Montana. The Indians were destitute and reported that they had to consume their horses during their march to Canada. North-West Mounted Police superintendent James Walsh met with them and explained the conditions under which they might remain in Canada. That same year, Sioux leader Sitting Bull brought 135 lodges of his people north from the United States to find refuge in Canada. Travelling with Sitting Bull was a small band of Sans Arc Sioux under Spotted Eagle and Minneconjou Sioux under Swift Bird. 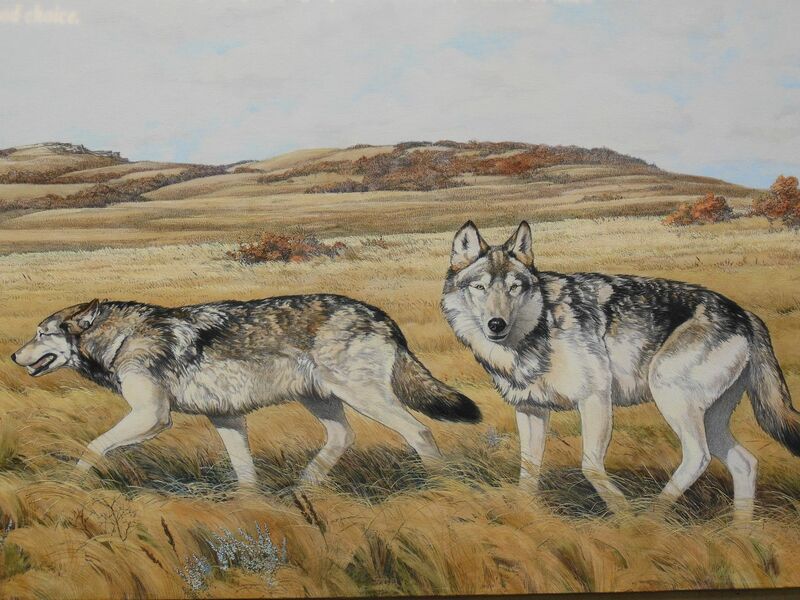 They settled in the White Mud River area in Saskatchewan. Here they found that buffalo still roamed the plains in greater numbers than in the United States. Major James Walsh of the North-West Mounted Police met with Sitting Bull and told him that the Sioux would now have to obey the queen's laws and in return they would receive the queen's protection. He warned the Sioux that they were not to return to the United States to hunt or to steal. Sitting Bull agreed to the terms offered by Walsh and declared his intent to remain in Canada. Major Walsh genuinely felt that the Sioux had been badly treated by the United States. Under pressure from both the United States and Canadian governments, North-West Mounted Police superintendent James Walsh attempted to meet with Sioux leader Sitting Bull to convince him to meet with an American delegation to discuss his return to the United States. Sitting Bull's son had just died and the chief was in mourning and not interested in a council. At this time, three Nez Perce warriors (Half Moon, Wep-sus-whe-nin and Wel-la-he-wite) arrived asking the Sioux for help in a battle against the American army which was taking place just south of the border. The Nez Perce, a Plateau area tribe, had never been Sioux allies and had often engaged in battle against them. The Nez Perce who arrived at the Sioux camp did not speak Sioux and were not fluent in Plains Indian sign language. They tried to indicate Snake Creek (the location of the battle) using the signs for "water" and "creek", but the Sioux thought they were talking about the Missouri River. This was a long distance away and the Sioux felt that it was too far away for them to be able to assist the Nez Perce. The arrival of three more Nez Perce men-Peopeo Tholekt, Koo-sou-yeen, and James Williams-helped straighten out the confusion. Major Walsh cautioned the Sioux that if they went to the aid of the Nez Perce they would lose their privilege to live peacefully in Canada. "Why do you come and seek us to go and talk with men who are killing our own race? You see these men, women, and children, wounded and bleeding? We cannot talk with men who have blood on their hands. They had stained the grass of the White Mother with it." However, Walsh convinced Sitting Bull and 25 others to come with him to Fort Walsh. 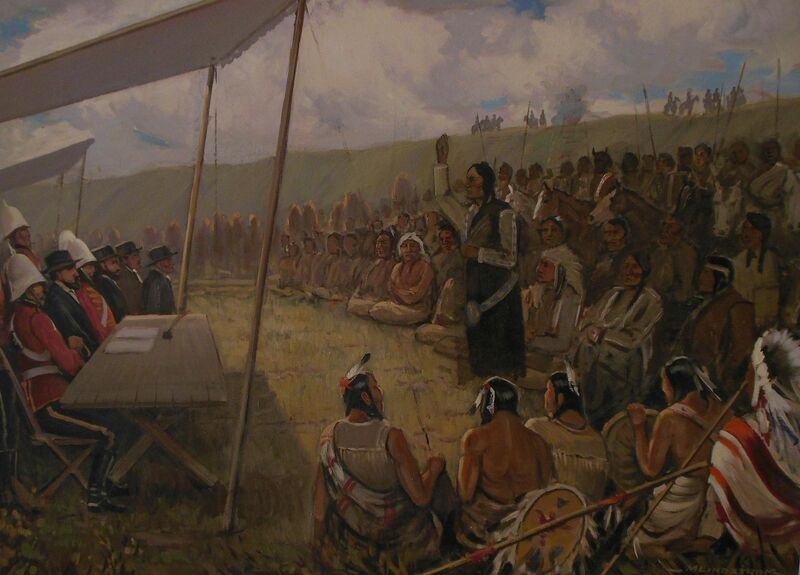 At Fort Walsh, the Sioux met in council with an American delegation. The Sioux leaders included Sitting Bull, Bear's Cap, Spotted Eagle, Whirlwind Bear, Flying Bird, Iron Dog, Medicine Turns-around, The Crow, Bear that Scatters, Yellow Dog, and Little Knife. Only Bear's Cap shook hands with the Americans. Traditionally this type of council meeting would begin with a pipe ceremony, but this was not done. The Americans told the Sioux that none of those who had surrendered had been punished for hostile acts and all had been received as friends. In offering peace with the Sioux, the Americans asked that they give up their guns and horses, conditions which were not acceptable to the Sioux. "You come here to tell us lies, but we don't want to hear them. Go back home where you came from." "These are the people that I am going to stay with and raise my children with." The Americans were insulted and offended by allowing a woman to speak to them in council. In 1880, Major Walsh, the Northwest Mounted Police officer who had been dealing with Sitting Bull's Sioux was reassigned. Sitting Bull had trusted Walsh and Walsh had a genuine concern over the fate of the Sioux refugees. Lief N.F. Cozier replaced him and began to pressure the Sioux to return to the United States. 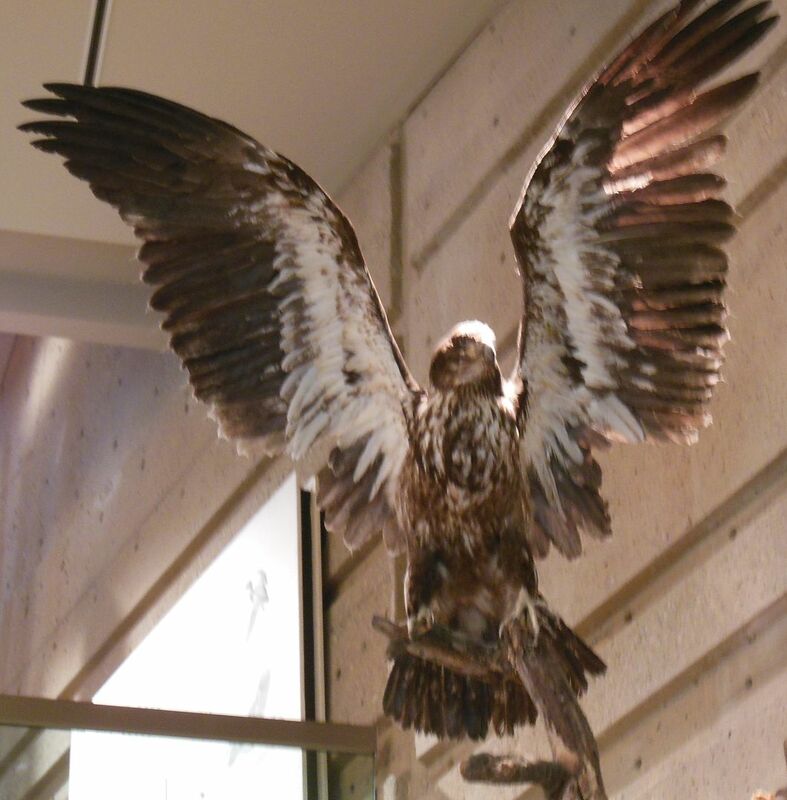 He persuaded the young Sans Arc Sioux leader White Eagle of the futility of staying in Canada. 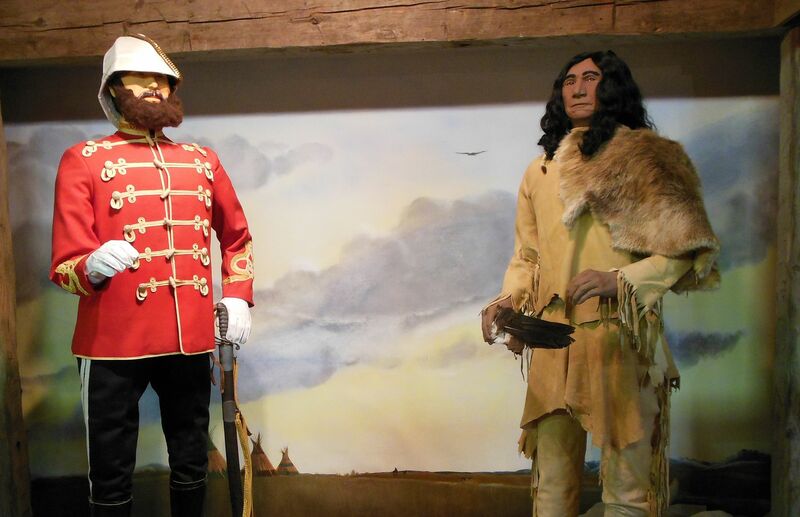 In 1888, the superintendent of the North West Mounted Police reported that there were now about 170 Sioux living in the area around Prince Albert, Saskatchewan. He reported that they were primarily Minnesota Sioux who did not have a treaty with Canada. In 1885, the Riel Rebellion broke out in Saskatchewan. The Métis, angered by the refusal of the Canadian government to confirm their riverlot claims along the Qu'Appelle and South Saskatchewan Rivers, organized their own provisional government with Pierre Parenteau, Sr. as president, Gabriel Dumont as military adjunct, and Louis Riel as people's council. "Let them go. We have seen enough bloodshed today." At the end of the battle, the Mounties and their militia allies lost 12 men and had 11 more wounded. The Métis, on the other hand, lost only five. Only through the intervention of Louis Riel did the Canadian forces manage to escape total destruction. The rebellion was short-lived and the Métis and their Indian allies were defeated by a large Canadian military force and the North-West Mounted Police. In Alberta, Blackfoot Chief Crowfoot rejected an invitation from the Cree to join their rebellion. He remained loyal to the North-West Mounted Police. In 1884, Parliament outlawed both the potlatch of the Northwest Coast peoples and the Sun Dance of the Plains tribes. The North-West Mounted Police were in charge of enforcing the ban against the Sun Dance. In 1889, North-West Mounted Police urged the Department of Indian Affairs to define which dances, if any, that Indians would be allowed to participate in. The police would then be able to enforce these laws. 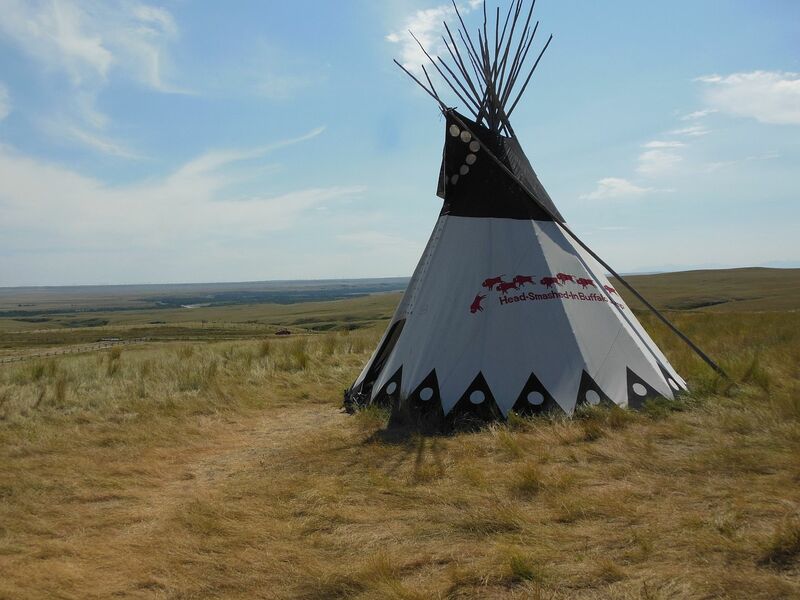 After visiting the Kainai Sundance, Sam Steele, the Superintendent of the Royal Canadian Mounted Police, wrote to his superiors asking them to discourage the ceremony. In 1904, King Edward VII conferred the title Royal upon the North-West Mounted Police. In 1920, their jurisdiction was extended throughout the entire nation and they became the Royal Canadian Mounted Police.